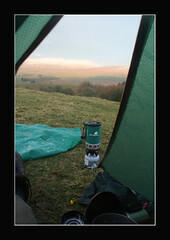 In a recent expedition to the Yorkshire dales, helping out on a Duke of Edinburgh Gold trip, I tried out my new Jetboil system. It’s fast, its efficient, it’s compact. The 1L beaker holds the burner and gas cylinder. It all fits together and self lights. Due to the cosy cover and heat distribution system it boils the water fast. I loved it on this trip where I would wake up and put on a brew to make a nice cup of ruibos tea. We had extreme weather – sleet, snow and rain. The going was tough but the tough just got going leaving me sitting drinking tea and contemplating my excellent lightweight tent and cooking equipment. There is a larger saucepan which is jolly handy for cooking up dinner and uses the same burner. It has a non stick surface so after we made our tuna fish curry I left it soaking and in the morning the residue just lifted off. Both the beaker and the saucepan have a neoprene cover that helps keep them warm and saves fuel. There are a variety of other accessories on the jetboil.com website.